Enhanced Aerobic Digestion | S&N Airoflo Inc. In 2003, Eden WWTP staff became aware of floating brush rotor aerators as a potential approach to providing oxygen transfer and mixing in the aerobic digester. The city of Eden,N.C.,operates an extended aeration process designed for an average flow rate of 13.5 mgd with a mixed liquor suspended solids concentration that typically checks in about 6,000 mg/l. This high biomass concentration is necessary to provide a well-settling sludge and good effluent quality. Further, the plant influent is approximately 40% domestic wastewater and 60% industrial wastewater. The industrial component is dominated by textile facilities.The Eden Wastewater Treatment Plant (WWTP) generates about 20,000 lb per day of waste activated sludge solids, which are aerobically digested prior to storage in sludge lagoons and ultimate land application. For many years, the facility has had difficulty maintaining adequate dissolved oxygen levels and adequate mixing in its aerobic digester. However, this all changed when the plant installed four new floating brush rotor aerators in May 2004. Aerobic digestion is a sludge stabilization process designed to convert waste activated sludge solids to carbon dioxide,water, residual cell debris and other end products. The oxidation of cellular material is referred to as endogenous respiration and is typically the dominant reaction in aerobic digestion.The detention time in the digester is normally about 20 days to achieve satisfactory solids stabilization. Additionally, the primary functions of an aerobic digester are to reduce odors, reduce biodegradable solids content, to prepare the sludge for ultimate disposal on land consistent with Federal 503 regulations.Aerobic digestion stabilizes the sludge solids more rapidly than anaerobic digestion, even though a less complete breakdown of cells is typically achieved. Oxygen can be supplied by mechanical aerators or by diffused aeration. At the Eden WWTP, vertical surface aerators have been used for many years. Plant personnel have had serious concerns because of operating problems as well as poor process performance. Prior to installation of the new floating brush rotor aerators, the plant had 145-hp of vertical aeration equipment in the aerobic digester.The vertical aeration equipment consisted of three 40-hp units and one 25-hp unit. In aerobic digestion, it is desirable to maintain at least 1.0 mg/l dissolved oxygen level to provide an efficient aerobic environment.Typical dissolved oxygen concentrations were 0.0 mg/l, which led to odor problems and poor aerobic digester performance. In addition, it is extremely important to provide adequate mixing to keep the waste solids in suspension. Typically, one-third of the aerobic digester was never mixed, creating dead zones detrimental to aerobic digestion. Moreover, it usually required two to three days of settling to facilitate efficient decanting of supernatant prior to wasting sludge to the sludge storage lagoons. Consequently, the aerobic digestion process performed below expectations and created operating problems for the WWTP staff. In 2003, Eden WWTP staff became aware of floating brush rotor aerators as a potential approach to providing oxygen transfer and mixing in the aerobic digester. The staff contacted S&N Airoflo of Greenwood, Miss., to discuss the potential of using these aerators for aerobic digestion.The company has been manufacturing floating brush rotor aerators for about 15 years. 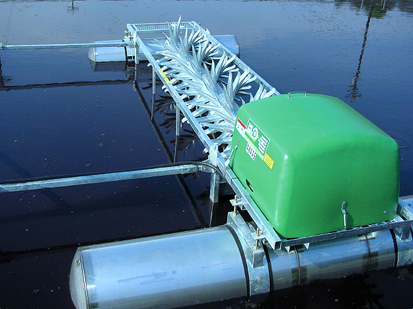 The company's aerators are in use in approximately 300 installations in the U.S. Most of these applications are aerated lagoons and oxidation ditches for municipal and industrial wastewaters, but the aerators have also been used effectively in aerobic digestion processes. Clean water oxygen transfer tests show that the company's floating brush rotor aerators produce some of the industry's leading results in terms of standard oxygen transfer rates. Use of these aerators usually provides significant energy savings while improving oxygen transfer rates and mixing. These aerators are capable of pumping up to 2,100 gpm per hp, which explains their excellent mixing abilities. In May, 2004, four 20-hp S&N aerators (80 hp total) were installed in the Eden WWTP's aerobic digester to replace the 145-hp of vertical aeration equipment.With a typical aerobic digester volume of 2.0 million gallons, the mixing intensity is 40 hp per million gallons.After reviewing seven months of operating data, the new aerators have maintained a minimum dissolved oxygen concentration throughout this period of 1.0 mg/l. Based on observations and measurements by the Eden WWTP staff, approximately 95% of the aerobic digester is now adequately mixed. Furthermore, the digester sludge solids settle well in 20 to 24 hours, providing for efficient decanting before the digester solids are transferred to the sludge storage lagoons.The average solids content of the aerobic digester is 4-5%, and the aerators have clearly demonstrated the capability to effectively mix this relatively concentrated sludge suspension. The city of Eden has been very pleased with the new aerators, city staff is now making plans to install these units in the two extended aeration activated sludge reactors. Based on energy cost savings and O&M cost savings, the aerators should pay for themselves in 2-3 years. Larry W. Moore Ph.D., P.E., DEE, is a professor of environmental engineering at the University of Memphis and a member of WWD's Editorial Advisory Board. Charles Van Zandt is the wastewater superintendent for the city of Eden, N.C. Moore can be reached at 901/678-3278 or by e-mail at lwmoore@memphis.edu and Van Zandt can be reached at 336/627-1009, ext. 320 or by e-mail at charles.vanzandt@ci.eden.nc.us.